In the economic-policy speech he’s scheduled to deliver Wednesday at Illinois’ Knox College, President Obama is expected to re-emphasize his “middle-out” view of the U.S. economy — that growth and prosperity derive from a strong middle class. Unfortunately, it’s been awhile since the American middle class felt strong. As the Pew Research Center summed it up nearly a year ago, middle-class Americans are “fewer, poorer, [and] gloomier” after enduring a “lost decade” of stagnant incomes, shrinking wealth and greater financial stress and uncertainty. And though some top-line economic indicators — unemployment, housing prices, the stock market — have improved since that time, Americans in general aren’t feeling much better about the economy. For starters, fewer Americans described themselves as “middle class” in 2012 than four years earlier: 49%, compared with 53% in 2008. 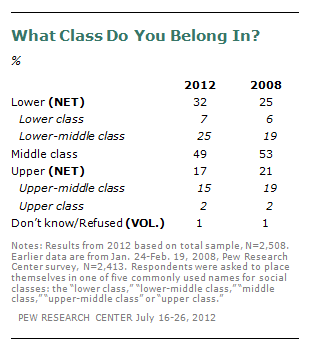 And the share describing themselves as “lower” or “lower-middle” class rose over that time, from 25% to 32%. However, the middle-class respondents were somewhat more sanguine about their personal situations. About equal percentages said they were more financially secure now than 10 year earlier (44%) as said they were less secure (42%); blacks and younger adults were most likely to say they had made progress over the past decade. Similarly, middle-class blacks, Hispanics and under-50 adults were most likely to say they were better off financially than before the recession. But only 28% of whites said they were better off, versus 45% who said they were worse off. Among people 65 and older, just 13% said they were better off, compared with 46% who said they were worse off. The middle-class survey showed an interesting partisan divide in self-assessment, with Republicans and independents saying they were recovering more slowly than Democrats. About half (51%) of all middle-class Republicans and 46% of independents said they had yet to fully make up their recession-era losses, compared with only about a third (35%) of Democrats. 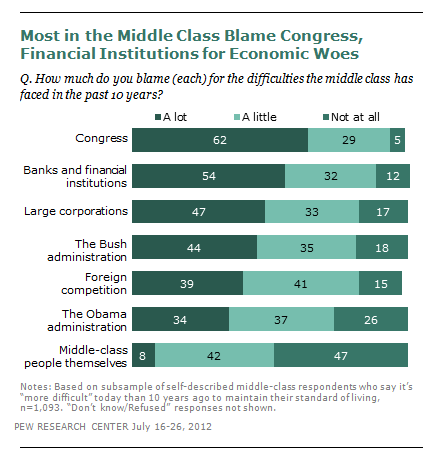 And who’s responsible for the difficulties of the middle class? While Congress gets the most votes, with 62% assigning it “a lot” of the blame, the Pew Research report found plenty of blame to go around. The one exception: Middle-class people themselves, with just 8% assigning their own socioeconomic group “a lot” of blame, and 47% saying they weren’t to blame at all.